Ever needed a place to keep notes organized? Millions of users worldwide rely on Evernote to do this. "Evernote is the modern workspace that enables you to be your most productive. Whether you’re a freelance designer collecting sources of inspiration or are a part of a team of professionals who want to work together more efficiently, Evernote helps you achieve your goals." 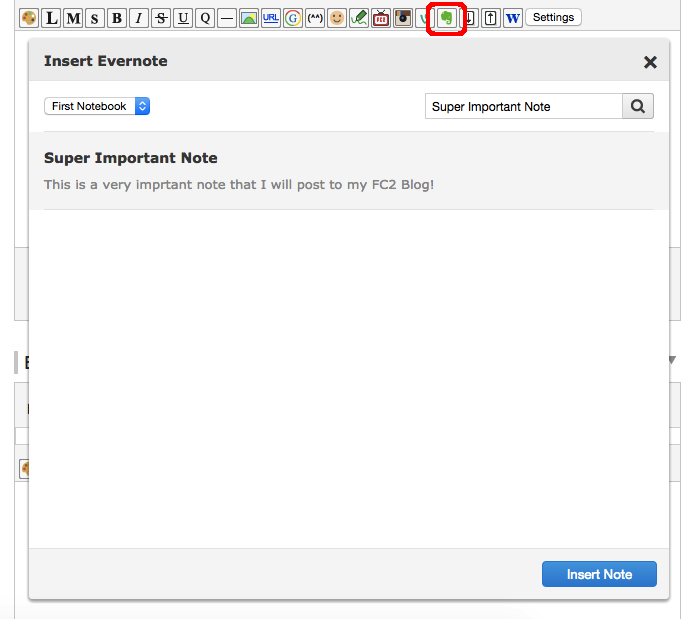 Now you can integrate the Evernote service directly with FC2 Blog! Simply integrate your FC2 Blog with your Evernote account from the Settings Page. Then all you need to do is click the Evernote Icon above the text editor when writing your Blog entry. A searchable list of your Evernote Notes will display. You can then simply click the one you want and paste it directly into your Blog! FC2 Blog Releases a Brand New Top-Page Design! HOME Share Vine Videos on Your Blog!